Snooker bosses insist player concerns about the new format and cramped conditions at the UK Championship will be addressed but say teething troubles are "inevitable" as the sport grows. 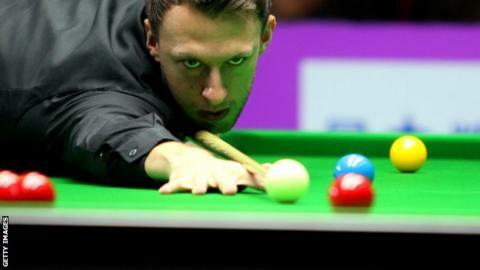 World number four Judd Trump described the new set-up at the event in York as a "circus", and several other top players have also complained. But Jason Ferguson, World Professional Billiards and Snooker Association chairman, told BBC Sport: "In York we now have 128 players competing and it used to be 32." He added: "Obviously that brings logistical problems and we are ironing out those problems as we go along." Trump defeated Gareth Green 6-2 in his first-round match but was still far from happy with the multi-table arrangement. "It took me 20 years to get in the top 16. Whether it works or not I'm not so sure. Whatever Barry (Hearn) does you need to let him get on with it. Without him we would be in big trouble. Barry and Jason (Ferguson) think it is best for the game so you need to trust them and hope it is. From a selfish point of view I'd prefer the old system. You win a few quid and are at every venue. You get on with it. Whatever system it is you need to win. Whether you are in round one or seeded through to the round of 32 you have got to win the matches." "It feels like a circus," the Bristolian said. "There is so much going on out there, you are watching other tables and you can't concentrate without the barriers." Ferguson added: "I saw Judd's comments. He has had a difficult season and I am sure he is feeling some pressure. But we do take concerns of players on board. "We had a players' meeting the other day and I am always around and available. "I can understand concerns and the new format has maybe felt a bit harsh for some players. It was a system that protected them for a long time but now they are exposed, so maybe some are a little bit concerned. "But as a governing body we have to make decisions for the global benefit of the sport. "There are more opportunities for players now but we have to make sure that it is a level playing field for all." World Snooker chairman Barry Hearn said a 'survival of the fittest approach' to tournaments is the fairest way prior to the second biggest event of the snooker calendar. But the controversy during the first few days at the Barbican has sparked further debate about the size of the venues staging the sport's top tournaments. Ferguson added: "Putting more tables into a venue obviously has an impact and there have been comments about the measurements, which we fully accept. "But they are the same measurements as the Crucible Theatre - so they are the same as the premier snooker competition. "It is enough space because we checked, but it is not what the players are used to. "We are always looking at venues and the fact that we may need more tables and more square footage." "The new format is going to take the top players out of their comfort zone, when previously they had fewer rounds to play. They now have two more matches than they would normally have at the UK Championship and it will be an irritation for them. "There will be an intimidation factor for the younger players against the top ones but they need to learn some time and this is what they turned professional to do - playing the best players at the best venues." The Ricoh Arena in Coventry has emerged as a strong contender to host next year's UK Championship following the success of the Champion of Champions event earlier this month. It was widely praised by the players and deemed a huge success and Ferguson said they were keen to hold another event there next season. The World Championship will be held at the Crucible until at least 2015 and the Masters has a contract to be staged at London's Alexandra Palace until 2015. But the UK Championship - the second of snooker's 'Big Three' tournaments - does not have a definite venue for next year. And the new-look format has raised questions if it is big enough to cope with 128 players all competing at the first-round stage. Ferguson added: "I don't think we have everything right by any means. It is inevitable there will be teething troubles and I talked to Barry (Hearn) about this this morning. "Out sport has grown massively in three years. There are clearly some negatives but let's look at all the positives. "We now have 30 worldwide events, when there used to be only six. Any business that grows that quickly will have teething problems."